Stop The Air Strikes and Targeted Killings NOW! The devastating events in Paris that have left 129 people dead are a horror. Ordinary people massacred while simply living their daily lives. This came a little more than a month after France, part of a U.S. led coalition, carried out dozens of airstrikes on Syria. This coalition had previously launched 3,000 airstrikes in Syria, massacring ordinary people in Syria who were simply living their daily lives. Now, in the wake of last Friday's bloodshed in Paris, this same U.S. led coalition, again including France, has launched even more airstrikes in Syria and Iraq. Escalating the so-called “war on terror” is leading to horrors of unspeakable magnitude for people across the Middle East and beyond. In four years of war, more than 200,000 Syrians have been killed, and almost 12 million more have been driven from their homes (out of a total population of 22 million). This is on top of the toll of death of millions across Iraq, Afghanistan, Pakistan, Libya, Yemen, Palestine and beyond, and the creation of millions more refugees. Civilians throughout the Middle East are dying, or roam the continent for survival, only to be demonized by those governments who are responsible for this situation. 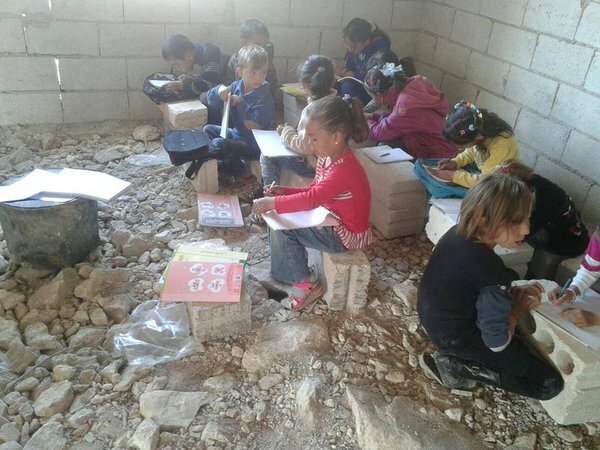 Above, children in Syria studying in rubble. Photo posted by anti-ISIS activist on Twitter, November 7. These people's lives are just as preciousas Parisian and American lives. In 2001, the Bush Regime launched an illegitimate invasion of Afghanistan under the rubric of “the war on terror” which was really a war for empire, expanding into Iraq (on the basis of outright lies) and beyond. 14 years later, including the two terms of President Obama, the powers-that-be still have no just solution to the catastrophe they created. So the horror continues to spread. What basis does Obama have to pontificate about crimes against humanity in Paris, when he is the commander in chief of an imperial military that is the modern world’s worst purveyor of violence, responsible for almost uncountable crimes against humanity including illegal invasions, occupations and wars, torture, death and displacement of millions across the planet? Each aggressive move the U.S. makes only ratchets up conflict and further endangers all of humanity. The Islamic State only wishes it could inflict the kind of terror that the U.S. is able to rain down from above using conventional air strikes, drone strikes, & other weapons of mass destruction that have been turned against the Middle East for decades now. From Sinjar to Beirut, where ISIS killed 40 civilians a day before the Paris attacks, their repressive agenda has nothing to offer humanity. They rejoice when the U.S. and other imperial powers attack the territory they control, hoping it will bolster their "legitimacy" and drive civilians in those areas to support them. This is not the kind of world we want to live in, a world where U.S./NATO forces and Islamic jihadists make war against each other, with both sides opposing the other while each side's actions only fuel the other side. And the people of the entire region are caught in the crosshairs. None of that changes the fact, however, that our responsibility as people living in the U.S. is to stop our own government's crimes, and by doing so, end this disastrous dynamic. An immediate stop to all U.S./NATO air attacks in Syria, Iraq, and Afghanistan. Stop all U.S./NATO support for Saudi air attacks in Yemen. An immediate stop to all U.S. "targeted killing" actions globally, including drone surveillance and drone assassinations, which are all key and active components of the secret ops the U.S. is reported to be carrying out this year in 147 countries. Stop the crimes of your government. American lives are not more important than the lives of others. Humanity and the planet must come first.